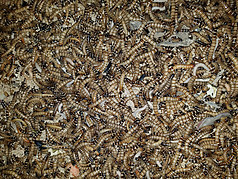 Hissing Roaches are large roaches common to the pet industry. Hissing roaches are climbing roaches so make sure you have a lid on any container you keep them in. Hissing roaches will eat a variety of foods and enjoy chicken egg layer pellets, fish food, dog food, cat food, and all kinds of fresh vegetables and fruits. They breed well in captivity and produce live young. Roaches must be kept at room temperature or above to stay active and healthy. Use slices of vegetables and fruit so that they can drink from it. Roaches can be gut loaded or dusted to increase nutritional value. Hissing roaches can live for 1 to 4 years. They can be housed in a fish tank with a lid, an enclosed reptile habitat, or other container that has an air flow but enclosed. You can use many different types of substrate for the floor of your roach house. We use different types of pine bark, straw, or wood shavings. You can also just keep it bare if you give plenty of hiding places. Egg crates work well to provide hiding places and room for young to grow. Roaches need surface area to increase in numbers. Providing egg crates will give them plenty of surface area and will result in more babies! You do not need to provide lighting, but heat is needed to breed. Hissers need at least 80 degrees to thrive and 80 degrees and more to breed. You can get just one or a pair of breeding stock. Male and Female Pair $12.22 Delivered! !